We all know people who are "book smart" yet can't seem achieve success, while at the same time others without much formal education are able to achieve great things. What is is that the successful people are able to do that eludes the others? 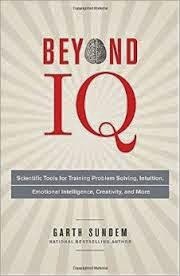 In Beyond IQ, the author Garth Sundem details the aspects of practical intelligence, which he argues is a greater predictor of success than IQ. He also offers examples and puzzles to help all of us train our brains to think in new ways in order to expand our cognitive abilities and look at everyday situations in new and creative ways. The book is divided into chapters which cover the various aspects of non-IQ intelligence. The author says topics came about as a result of his interviews with researchers on the subject of human intelligence, as well as extensive reviews of professional literature. Some of the topics he covers include creativity, intuition, willpower and problem solving. There are a variety of word and picture puzzles and activities in each chapter to help re-enforce a particular skill. Helpfully, the answers are included at the back of the book if you encounter some particularly vexing problems. While most of the answers are straightforward, I did have a problem with some that I felt had 'areas of gray' in them. For instance, in the chapter on Practical Intelligence, the author includes some scenarios with four possible reactions. After choosing your answer, you can look in the back of the book to see the best and worst answer for the questions. Apparently, these types of questions are frequently used by HR managers to weed out undesirable applicants. However, I felt that the declaration of the best and worst answers were fairly unhelpful without further explanation as to what these right and wrong answers were supposed to be demonstrating. It also alarms me to think there might be HR managers out there who administer these tests and blindly follow the "right" answers to weed out applicants (although I suppose this is one way to eliminate people from a large group!). I liked the variety of subjects covered and exercises that were included. As many studies have shown, people who engage in mentally challenging activities (crossword puzzles, reading, writing, etc.) remain cognitively sharper into old age, so anything we can do to improve our brain function as we age is beneficial. I especially liked the exercises meant to help filter out distractions and improve mental focus, although those are the ones that will take the most practice! Disclaimer: I received a copy of Beyond IQ from Blogging for Books in exchange for this review.